Wildlife Enthusiasts will enjoy this exclusive Bear Viewing Location at the coast of Lake Clark. At Silver Salmon Creek Lodge the landscape, wildlife and outdoor opportunities combine to offer visitors a true sense of Alaskan wilderness, with towering volcanic mountains forming an immediate backdrop to the tidal marshes, streams and pristine salt-water bays which comprise the coastline. Guests can choose to fly in from Anchorage, Homer or Soldotna. Photography is a major component of our services at Silver Salmon Creek. We have developed a safe and successful program of moving into the habitat of brown bears, being careful not to disturb the free-ranging nature of their movements. No permits are needed and no viewing platforms are used. Tour leaders have chosen our facility to bring their clients, resulting in exceptional opportunities for unique images and peaceful encounters. Also of interest to photographers are nearby pelagic bird populations, including horned and tufted puffins, black-legged kittiwakes and murres. Bald eagles, trumpeter swans, and harbor seals can also be targeted on our personalized nature tours by land and sea. Scenic backdrops include volcanic Mt. Iliamna, Mt. Redoubt, and Augustine volcano, all part of Cook Inlet's "ring of fire. 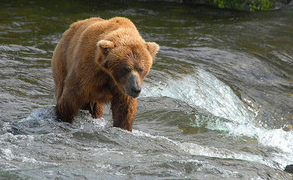 If you're looking for some outstanding bear viewing, Silver Salmon Creek Lodge is a great choice. 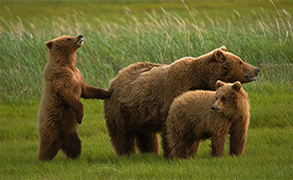 The lodge has a safe and successful bear viewing program here for nearly 15 years. All guides are experienced bear guides, the bears are in their natural habitat and our unique location in Lake Clark National Park on the west side of the Cook Inlet ensures that you won't have to fight the typical crowds as on Katmai's Brooks River. You will be able to move freely about while observing safe bear viewing practices in the company of one of our well-trained guides. Our tours are particularly popular with photographers. Our lodge features a computer with digital media readers and a CD burner for use by our guests maximizing your enjoyment if you have a digital camera. We also offer a high speed internet connection in case you want to email images to your jealous friends! The lodge sits on a rare and isolated private in-holding within the coastal section of 4 million acre Lake Clark National Park and Preserve. The surrounding watersheds and marine ecosystem provide optimum habitat for five species of salmon, dolly varden, halibut and a prime location only 40 minutes away from Bristol Bay rainbow fisheries. Short, coastal rivers and creeks cascade from the surrounding Chigmit mountain range down to the remote lower west side of Cook Inlet. King salmon, chum salmon, pink salmon and red salmon are all available but perhaps the most coveted species of all is the hard fighting, aggressive silver salmon. The local rivers provide optimal conditions for what is fast evolving from a novelty to a passion within the sport. Dry fly fishing enthusiasts are flocking to Alaska to target salmon on the top water. Only a varied few watersheds throughout the state provide the conditions necessary to hook and land salmon on top water and Silver Salmon Creek is one of these rare places. Explosive and dramatic surface takes have humbled many a seasoned angler and left all yearning for more. Light tackle surface anglers are also able to take advantage of this exciting fishing with our guides providing the knowledge and skill in landing a salmon on top water. Our 25' charter boats takes anglers to offshore halibut grounds with high success rates and all gear provided. Vacuum seal machines insure your catch will be properly processed for traveling. Other activities include our popular bear viewing photography program, boat visits to nearby sea-bird rookeries, sea-kayaking, fossil exploring along an ancient Jurassic seabed, clam digging for succulent razor clams, canoeing, hiking, beach-combing or wilderness tent camping. Alaska's Cook Inlet is a popular kayaking destination, but the West side of the inlet has been out of the reach of most paddlers due to a lack of guides and facilities. Silver Salmon Creek Lodge is proud to announce the first full-service kayaking operation on the West side. Let Silver Salmon Creek be your kayaking base on the West side of Cook Inlet. We offer a variety of kayaking experiences, ranging from beginning paddles with instructor and all equipment provided to full-day trips for those with some experience and multi-day trips for those with more time. All trips away from the Lodge are guided. Full day kayaking tours through Tuxedni Bay are available in late May through early July. The wildflowers are peaking during those months and the famous Cook Inlet tides will help propel you up into the Bay where you can see a glacier as well as the towering Mt. Iliamna, one of America's largest active volcanoes. At high tides the creek and sloughs around the Lodge itself become an ideal kayaking site. They are excellent for beginning paddlers but feature plenty of scenery to keep the veteran enthusiastic. You may see a Brown Bear and cubs feeding on the grass, or a Bald Eagle scouring the shoreline for food. The menu features local seafood including salmon, halibut, clams and mussels, as well as fresh greens and herbs from our garden. Guests dine in intimate "family style" in a comfortable dining room with spectacular views of the Cook Inlet. It is not uncommon for a bear to appear on the meadow in front of the lodge during dinnertime, completing the ultimate Alaska dining experience. Meal times are flexible to accommodate guests many activities at the lodge.